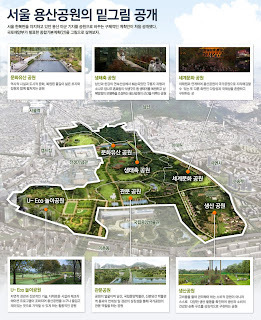 Korea's Ministry of Land, Transport and Maritime Affairs unveiled yesterday* its master plan for the future Yongsan Park (to replace Yongsan US Army Base). Base case scenario used to be 2017 but now, the first temporary parks are announced for as early as 2015... and completion for as late as 2025. Obviously, a quick and dirty draft to be updated later. Because the park itself is only a detail, an environmental joke, a mere alibi for what basically represent one of the biggest real estate operations of this young millenium : clearly, what all homeowners around and all developpers nationwide were waiting for were construction guidelines around Seoul's next Central Park. Frankly, I didn't expect less from a buldozer-friendly government that already authorized universities to build higher on Seoul's last protected mountains, and agressively sacrificed big chunks of the capital's last greenbelt areas. At least, let's hope the park itself will be an environmental success.